After all the prefight talk, there was little left to say Saturday night. Unbeaten light heavyweight Chad Dawson translated his thoughts through his gloves, thoroughly outboxing Antonio Tarver to capture the IBF/IBO belts with a unanimous, 12-round victory at the Palms. IBF light heavyweight champion Antonio Tarver puts his title on the line against former WBC light heavyweight champion Chad Dawson Saturday night in the Pearl Theater at the Palms. 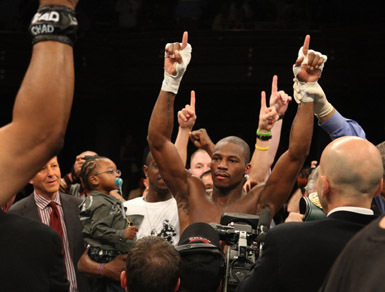 The past two weeks Antonio Tarver and Chad Dawson have talked, talked, and talked some more. But tonight inside the Pearl theatre at the Palms, only one man will win the war of words. The story line of the fight frames it as a clash between an unbeaten up-and-comer in Dawson and an established yet aging world champ in Tarver. Antonio Tarver and Chad Dawson continue their war of words at a prefight press conference prior to their light heavyweight title fight set for Saturday, October 11th at the Palms. A day after Dawson and Tarver exchanged fiery responses in a national media teleconference, the 26-year-old Dawson again pointed out that he will prove to the world that he, not Tarver, is the sport’s best light heavyweight. The trash talk might have been cleaner than on last week’s national teleconference, but Tarver’s message that Dawson does not measure up remained crystal clear. All-In host Alex Adeyanju and boxing writer Andy Samuelson break down Saturday's Antonio Tarver-Chad Dawson light heavyweight title fight. Tarver was known as Mason "The Line" Dixon in 2006, and despite being a heavy favorite against 50-something Rocky Balboa in the movie of the same name, Tarver was lucky to pull out a split decision. Dawson’s calm and cool demeanor at the gym stood in stark contrast to the fireworks on a contentious conference call featuring both fighters and promoter Gary Shaw earlier in the week.